Thanks for your response. Added code, still there, cleared cache. I fixed it .. I added outline:none to #viewer. Voila! Thanks for all your help. Border still there .. thanks for trying though. Strange .. if I click on the images the border displays but if I then click outside of the borders, the border disappears. Thanks for your responses. Screen capture http://i605.photobucket.com/albums/tt13 … Border.jpg. If it is not showing on anyone else's computer .. I am happy, although I must admit its very annoying. I disabled all the add ons, even re-booted my computer, but it made no difference. My mistake .. I should have said that when you click on the tiles, a dotted border appears. Container is #flashcontent and border already set to none. Using Firefox 7. Developer toolbar refers #flashContent > embed#viewer but I can find no reference for #viewer in html or css. Adding #viewer border:none to css .. still showing dotted border. Sorry if this question has been posted but I did a search both on the forums and googled it. Hi I have installed tilt pro in my website http://www.kimberleywebdesign.com.au/Se … index.html and although it displays well on my big screen .. on my laptop there is too much space between the main content and the flash content. Hi! 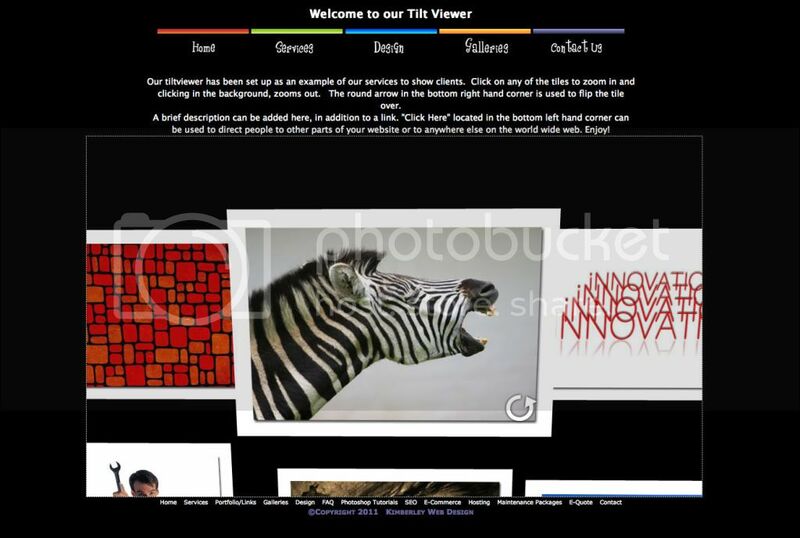 I recently purchased tilt viewer pro for flash and have used absolute links to other pages in my site. Out of the 4 links only one works and all links are correct as far as their paths. I have edited the xml gallery in dreamweaver cs3, saved it and uploaded the new saved version. Still not working. Links work perfectly in local view. I have all files relating to TiltViewer in a folder on my local computer and have uploaded the folder many times but still only the one link working. Do I have to redo the swf file and index folder from scratch to make it work or will simply editing the xml file and saving and uploading work. Only tile 6 works, 4,7 and 9 dont work. Hope you can help, as I have read all documentation and wasted alot of time trying to resolve this issue. Hi Love the tiltviewer. Thanks so much for sharing. I wondered whether it was possible to have the image on one side and on the reverse link to another page in my website.